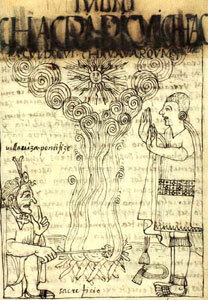 Illustrations from 1615 by The "Indian Chronicler" Felipe Guaman Poma de Ayala about the Months and the Festivals. Finding his most persuasive medium to be the visual image, he organizes his 1200-page Nueva corónica y buen gobierno (New Chronicle and Good Government) around his 398 pen-and-ink drawings, all skillfully executed by his own hand. For the archaeologist, Guaman Poma's drawings of native life under the Incas are like photographs of the past. January. 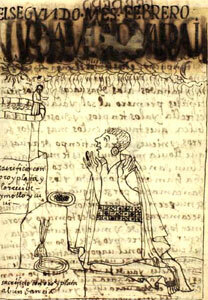 The Inca's penance and fasting. 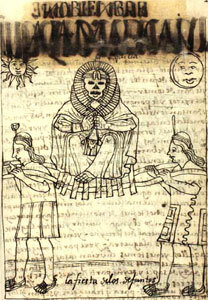 During that month they offered sacrifices, fasted, made penance, and covered their bodies and heads with ashes, as the Incas still do today, and went in procession to the temples of the Sun, the Moon, their gods, and all huacas (sacred place). February. They made offerings of great quantities of gold and silver. 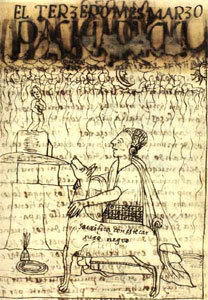 The Inca is represented kneeling bareheaded, making an offering (perhaps to the stone of Huanacauri). This is the wet season, if often rains... they used in particular to visit the huacas of the high mountains and the snows. April. Feast of the Incas. They sacrifice "red sheep." This is "a very great feast to which all the lords, the princes, and the poor Incas were invited; they ate, sang, and danced on the main square." May. 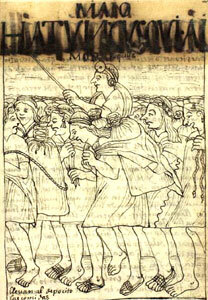 The illustration shows Indians carrying supplies of potatoes to the warehouses. It was the feast of the Aimara; there was much singing and drunkenness. June. The month of Inti-Raimi. 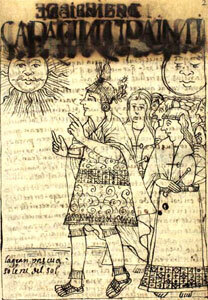 The Inca is represented "drinking with the Sun at the Feast of the Sun." July. The harvest festival. 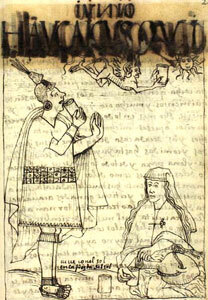 The illustration shows the High Priest making an agrarian sacrifice before the Inca, who has removed his headdress. September. Great Feast of the Moon, wife of the Sun. The town of Cuzco is purified. 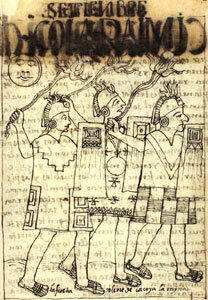 The illustration shows three purifiers banishing evil from the city with torches in their hands. October. Procession to ask God for water. "This hungry black sheep helps men to weep and ask God for water." November. Feast of dead. 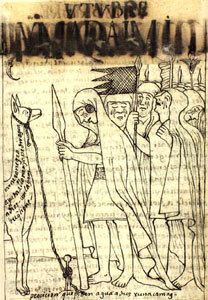 The mummies of dead kings are carried in state. 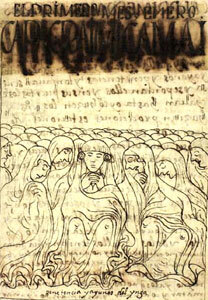 They are given food, they are clothed in rich robes, with feathers on their heads; the people sing and dance in their company and carry them through the streets to the main square. December. Capac Inti-Raimi. 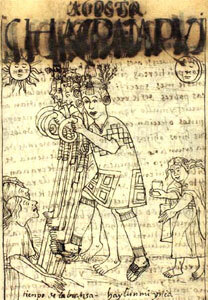 This is " the great Feast of the Sun, which is the king of the heavens, of the planets and stars, and of all up above. Capac means king, Inti mean Sun, and Raimi great feast. Much gold and silver plate is sacrificed to the Sun; five hundred innocent children, boys and girls, are buried alive, standing upright, with these offerings of precious plate and livestock. 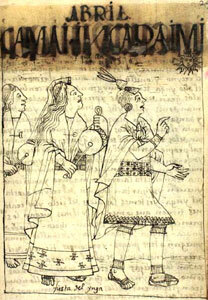 After the sacrifice, a great feast is held at which they eat and drink to the Sun and dance in the public squares of Cuzco and throughout the kingdom; and those who become too drunk, or who turn their heads towards the women, or who blaspheme and use bad language are all put to death." Reference: Guaman Poma - 'El primer Nueva corónica y buen gobierno'.